What is the relationship between the brain and consciousness? Some will point out we have to define our terms: what is the brain, what is consciousness? We can roll out an effective definition of the brain (it’s where most neurons are). But consciousness eludes definition. Still, that does not mean we cannot say more. And, from saying more, we will define more. Schematic of a nanoparticle network (about 200 nanometres in diameter). By applying electrical signals at the electrodes (yellow), and using artificial evolution, this disordered network can be configured into useful electronic circuits. Modern physics talks of the electron. What is it? Well, we don’t know, strictly speaking. But fuzzy thinking, we do have a theory of the electron, and it’s so precise, it can be put in equations. So it’s the theory of the electron which defines the electron. As the former could, and did vary, so did the latter (at some point physicist Wheeler and his student Feynman suggested the entire universe what peopled by just one electron going back and forth in time. Hence the important notion: concepts are defined by EFFECTIVE THEORIES OF THEIR INTERACTION with other concepts (General Relativity of Ontological Effectiveness: GROE). 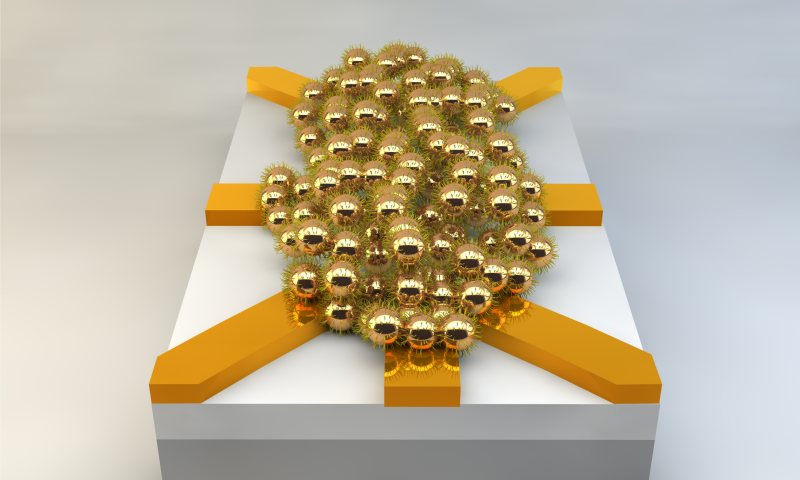 Random assemblies of gold nanoparticles can perform sophisticated calculations. Thus Nature can start computing, all by itself. There is no need for the carefully arranged patterns of silicon. Classical computers rely on ordered circuits where electric charges follow preprogrammed rules, but this strategy limits how efficient they can be. Plans have to be made, in advance, but the possibilities become vast in numbers at such a pace that the human brain is unable to envision all the possibilities. The alternative is to do as evolution itself creates intelligence: by a selection of the fittest. In this case, a selection of the fittest electronic circuits. To close the gap, one goes back to basics. The first electronic computers, in the 1940s, tried to mimic what were thought at the time to be brain operations. So the European Union and the USA are trying more of the same, to develop “brain-like” computers that do computations naturally without their innards having been specifically laid out for the purpose. For a few years, the candidate material that can reliably perform real calculations has been found to be gold. Van der Wiel and colleagues have observed that clumps of gold grains handle bits of information (=electric charge) in the same way that existing microprocessors do. Clump of grains computing operate as a unit, in parallel, much as it seems neurons do in the brain. This should improve pattern recognition. A pattern, after all, is characterized by dimension higher than one, and so is a clump operating together. A mask to recognize a mask. Patterns are everywhere, logics itself are patterns. So what am I saying, philosophically? I am proposing a (new) foundation for ontology which makes explicit what scientists and prehistoric men have been doing all along. Things are defined by what they do. And they do what they do in relation with other things. Where does it stop? Well, it does not. What we have done is define being by effectiveness. This is what mathematicians have been doing all along. Defining things by how they work produce things, and theories, which work. The obvious example is mathematics: it maybe a castle in the sky, but this castle is bristling with guns, and its canon balls are exquisitely precise, thanks to the science of ballistics, a mathematical creation. Things are what they do. Fundamental things do few things, sophisticated things do many things, and thus have many ways of being. Be reassured, creatures of little faith: Effective Ontology is very practical. First of all, that’s what all of physics and mathematics, and actually all of science rest (and it defines them beyond Karl Popper’s feeble attempt). Moreover, watch Europe. Some, including learned, yet nearly hysterical commenters who have graced this site, are desperately yelling to be spared from a “Federal Europe“, the dreaded “European Superstate“. The theory of Effective Ontology focuses on the essence of Europe. According to Effective Ontology, Europe is what it does. And what does Europe do? Treaties. A treaty, in Latin, is “foedus. Its genitive is foederis, and it gives foederatus, hence the French fédéral and from there, 150 years later in the USA, “federal”. Europe makes treaties (with the Swiss (Con)federation alone, the Europe Union has more than 600 treaties). Thus Europe IS a Federal State. Effective Ontology has been the driver of Relativity, Quantum Physics, and Quantum Field Theory. And this is precisely why those theories have made so many uncomfortable.